It is our pleasure to present to you another eye-opening interview we’ve had with one of our Digital Design alumni, Maggie Wang, UX/UI Designer at IUGO Care. Maggie gives us an insight in the creative process of her grad project BikeIt, including its challenges and results, and tips for current and future Digital Design students. Bikeit is a mobile application that helps cyclists plan ideal cycling routes, find secure bike parking, and keep up with community events and news while being rewarded for helping to improve the urban cycling experience. What inspired you to create your BikeIt? I grew up in Taiwan and there were bikes everywhere. People there don’t just use bikes to commute, but also to shop, to meet friends, etc. So when I moved to Vancouver in 2004, I was surprised there were so few bikes around. Recently, however, there seem to be more; in fact, since 2010, the city has actively encouraged more people to cycle, as part of a commitment to a greener Vancouver. Most people can see the benefits of cycling, both for their health and for the environment. However, I’ve noticed that many people are still hesitant to ride a bike. For my grad project, I decided to find out why, and how to make things better. My approach is to understand the problem through surveys and interviews. Many of the people I spoke with said riding a bike in Metro Vancouver is inconvenient, unsafe, and stressful, especially for beginner and recreational cyclists. My research also showed people wanted a convenient way to access cycling information, such as cycle routes, bike parking areas, and types of cycling gear. Within the timeframe I had, for me, success for this project meant seeing the focus groups testing a functional prototype, and receiving positive feedback from them (specifically, that they felt it would be a useful application that added value to their daily cycling routine). Did you, at any point during the making of your BikeIt, felt lost and unsure on how to proceed? If so, what helped you get back on track? What were the challenges that you needed to overcome when it came to designing? My challenge was not only to create a user-friendly app that encouraged people to get on their bikes, but also to design it so that they would keep using the tool as they grew more confident about cycling. Using focus groups to try out my prototype, collecting their feedback, and making changes all along the process were all key to tackling this challenge. To tackle the interface design challenge, I collected and analyzed information from city planners, local organizations, and bike-related businesses, as well as focus groups. I then came up with a variety of initial designs to test. After testing with my target audience and putting myself in their shoes, I kept the designs clean, simple and easy-to-navigate. Most of my creative design inspiration came from the process of understanding my users and researching cycling-friendly countries such as Norway, Germany and Spain. For me, the graduation project was an opportunity to try out different wireframing and prototyping tools. I used Proto.io, OmniGraffle and Axture for the overall interface flow. Pixate, and Principle for interaction effects. I found both OmniGraffle and Pixate intuitive to use. For wireframing and prototyping, I would recommend tools I discovered through work, after VFS: the combination of Sketch (w/ Craft Plug-in) + InVision. Exploring and learning new software within a tightly limited timeframe was an interesting challenge, but figuring out how to apply it correctly at different stages of the process requires practice time which I didn’t have. If I could go back again, I would have simplified the process by using Sketch (w/ Craft Plug-in) and InVision. You mentioned that you were approached by the City Manager of Vancouver for Biko. What was the intent for the meeting? Christopher, one of my VFS instructors, connected me with the City Manager of Biko (Molly E. M) through social media last year (Thank-you Chris). Molly had seen details of my BikeIt graduation project on my website, and was interested in finding out more about it. We emailed each other back and forth for a few months, then she asked if I might like to become a Brand Ambassador/City Coordinator with Biko. However, I found out this role is focused on business development and sales, which are not really part of the career path I’m considering at the moment. So the position didn’t work out, but I’m still grateful to have met Molly, and to have discovered that there is a product similar to Bikeit already on the market. For me, this confirms concept approval for BikeIt. Interestingly enough, Biko and BikeIt were being developed at roughly the same time, which suggests there was a clear need for this kind of app. What is Biko about and how is it different from Bikeit? As I understand it, Biko is dedicated to creating a fun biking community and greener planet in various North and South American cities, including Vancouver, Mexico City, and Bogota, by rewarding people who ride their bikes. The main goal is to build a cycling network on a large scale. In contrast, BikeIt was specifically designed for Metro Vancouver. Its main goal is to improve the urban cycling experience in our city by rewarding the cyclists who use this platform and helping them plan ideal cycling routes, find secure bike parking and keep up with local cycling news. So, while both applications aim to create a greener environment, they are different in terms of scope. Also, BikeIt focuses more on safety and education while Biko is more about lifestyle – for example, the points you earn through Bikeit can only be spent on bike-related products and cycling lessons, but Biko points can be spent on anything, including drinks in the local pub. What was your reaction when you found out that there was such interest following your grad project? I was thrilled to hear people out in the “real world” were interested in my project. BikeIt was part of an academic program – the culmination of an intensive year at VFS – but throughout the development process I tried to be as practical as possible. The response outside the school really validated that I had succeeded in this goal. Every so often, you get an opportunity to work on a project that can really make a difference – that has a positive impact on social causes and society at large. This kind of project is pure joy for me. That is probably why I invested so much time and passion in BikeIt. BikeIt was much more than an assignment. It always works better if you choose a topic that you are passionate about and feel connected to — ideally, you should have some previous experience with the “problem” that you want to solve. Since you graduated, what sort of projects have you worked on? I’ve worked on several native iOS mobile applications in the Real Estate, Custom Earphone, Health and Entertainment categories, as well as two responsive web design projects for BCCDC and City of Surrey. Also, a couple of digital media, data visualization and infographic projects for BCSTH, AWP and AIDA organizations. How is it different to work on a project outside of VFS compared to the projects you have done in VFS? The biggest difference between working at VFS and outside VFS is the motivation and intention. At VFS, you create things for your own interests; outside, you are working for clients. The strategies involved in understanding your hypothetical audience versus your client’s actual audiences are different. Looking back at your year in the Digital Design program, what were the things that you appreciated the most? The comprehensive program structure and the knowledgeable instructors. What would be the one thing that you learned that you think helped you the most after you graduated? Interface Design Principles and User Experience Design. To keep learning and creating meaningful products that have a positive impact on society. I am constantly inspired by the world around me. Colours, tastes, textures, perfumes – to me everything is alive with beauty and purpose. I read mostly inspirational and spiritual books, ex. The Artist Way. I’m currently reading: The Wave and The Light Between Oceans. What sites do you visit on the internet often? It varies depending on my mood. Right now, I’m into Jazz, Indie pop and Folk. Inspirational Stories, Dark Comedies, and Documentaries. I like to visit local museums, art galleries, consignment stores and flea markets, especially when I’m traveling. I collect shells, stones, stamps, vintage posters and pens. Collages with Graffiti + random design ideas. Postcards and sticky notes with inspiring quotations. To Do list, and magnetic fridge poetry. There are many people I admire. The top three would be Ansel Adams, Henri Matisse and Salvador Dali. Who are the practitioners you look up to (have inspired me) in your field? I look up to people who are passionate and intelligent. At the moment, my best professional role models are Katherine Dodds (Founder of Hello Cool World), Chris Hobbs, David Hobbs (Co-founders of Two Tall Totems) and Brian Chesky (Co-founder, CEO of Airbnb). After some days of sun, in early February, the first snowfall arrived in Vancouver and the visit of Class 37 to DDB was also held. On February 3th, the group met at 13:00 at the Digital Design campus to start their way to the studio. Between a snow storm and a snowball fight, we arrived to a beautiful building close to West Georgia Street. After taking the elevator to the 16th floor, we reached a more comfortable atmosphere of creativity and design. Known as one of the best advertising companies in the world, the feeling of having arrived to a place where you would want to work in was felt by the whole group. Sara Caissie, the Account Supervisor at DDB, gave us a warm welcome and led us to a more pleasant place to talk about the company and answer our questions. Stéphane, a Creative Director at DBB, joined Sara to discuss the company structure and share some of DDB’s projects. They introduced the different areas that exist in the company such as: Strategy planning & research, Traditional Advertisement, CRM (customer relation management), etc. For DDB to continue to be one of the most recognized worldwide companies and at the same time be able to transmit the correct messages to the audience has been a challenge, but not impossible. They mentioned that in each project, they seek to create something unique as an experience for the users. After a Q&A session, we started a tour around the floor where we saw the different workplace areas, brainstorming notes on the walls, card sorting, and other conceptual work. We also were able to enjoy the beautiful view that they have of the Vancouver Art Gallery plaza. For their last motivational words, they told us to embrace criticism of our work to grow as designers and make our work better. 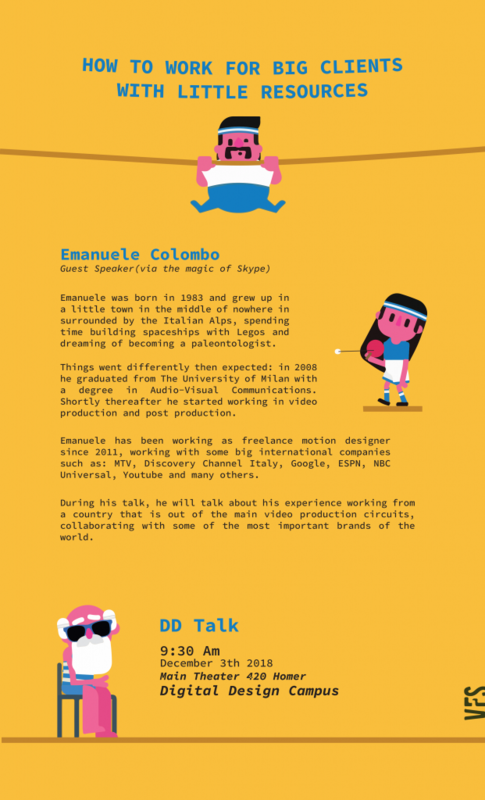 For the future, they advised us to work as freelancers to build our industry profiles. DDB, like many companies, search for people with specific skills to work on projects. Also they invited us to send them our portfolios after finishing the DD program to see if they can offer us some internships. All the 37’s want to give special thanks to Louise Lee for arranging the visit to DBB, to Danny Chan and Stephanie Wu for their patience and support and finally, but not least all, the staff of DBB for their advice and warm words.